Who is Sri Sai Baba? The life of Sai Baba is as wide and as deep as the infinite ocean; all can dive deep into it and take out precious gems (of knowledge and bhakti) and distribute them. Who is Sai Baba? This is not an easy question to answer! Even if we were to assemble all the available information, an adequate explanation is likely to elude us. One might as well ask "what" as much as "who", for how to describe the indescribable? How to explain the inexplicable? And how to speak about the unspeakably mysterious? As G. R. Dabholkar (alias Hemadpant), the illustrious author of the Sri Sai Satcharitra1 helplessly submitted, "Who can describe Baba's boundless love and his wonderful natural knowledge and his all-pervasiveness?" In fact, here Hemadpant has given us a clue to Baba's identity: for many of his devotees, Baba is an embodiment of love, "boundless love", and once we begin to explore the question of who Baba is, we realize that it is not something to be described, but rather something each of us can experience for ourselves. Then, as Hemadpant says, "Blessed are they who can experience one or all of these!" Sai Baba is revered as one of the greatest saints ever seen in India, endowed with unprecedented powers and worshipped as a God incarnate. This mysterious being, who arrived unannounced in Shirdi as a youth and remained there throughout his long life, transformed the lives of those who met him and continues to do so for those whose hearts are touched by his love. Baba stated that his mission is to "give blessings" and he proves it in myriad ways: healing the sick, saving lives, protecting the vulnerable, averting accidents, granting offspring, facilitating financial gain, bringing people into harmony with themselves and each other and, above all, in effecting the spiritual evolution and transformation of those who come to him. Baba is, as one of his contemporary devotees put it, "the embodiment of the Supreme Spirit, lighting the sadhakas' path by his every word and action." To his devotees, Baba is nothing less than God. An outstanding aspect of Sai Baba is that he is beyond distinctions of religion, caste or creed. Some believe him to be Hindu, others see him as a Muslim. He embodied all religions yet was free from all strictures. Hindus and Muslims find their meeting point in Sai, and people from all communities and all walks of life are united by the great love and reverence Baba inspires in them. "I look on all with an equal eye," said Baba, and he would brook no dispute or religious bigotry among his disparate devotees. 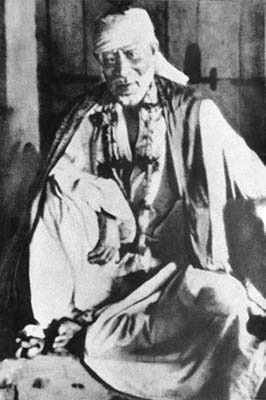 As Sri Babuji observes in Arati Sai Baba, "Not identifying in totality with any religious community, by steering himself along an unbiased middle path of transcendence, seems to be the constant leitmotif of Baba's lifestyle. The popular notion is that Baba expressed himself as a Hindu to Hindus and as a Muslim to Muslims. However, in most cases Baba acted vice versa, insisting that the Hindus should accept him as a fakir and the Muslims as a Brahmin!" Hindus could claim Baba as their own as he responded to their needs and permitted worship according to their rituals, but they could not deny the fact that his dwelling place was a mosque and the name of Allah was ever on his lips.